Tucson, AZ, WPH Press, 10/7/18- The Race 4 Eight kicked off in Atlanta on the first weekend in October, producing a stunning upset of the R48 #1, the crowning of a new R48 champion, and the first brother vs. brother final in R48 history. Lucho Cordova and Danos Cordova knocked out the #1 and #2 players on the R48 tour, respectively, in the semifinals, with both appearing in their second R48 final on their home court at the Recreation ATL. Lucho overcame his younger brother for his first R48 title in one of the most exciting R48 finals in history, needing six match points in the third game to hoist the R48 crystal. Other big movers in the rankings were Mando Ortiz (from #3 to #8) and Martin Mulkerrins (from unranked to #17). 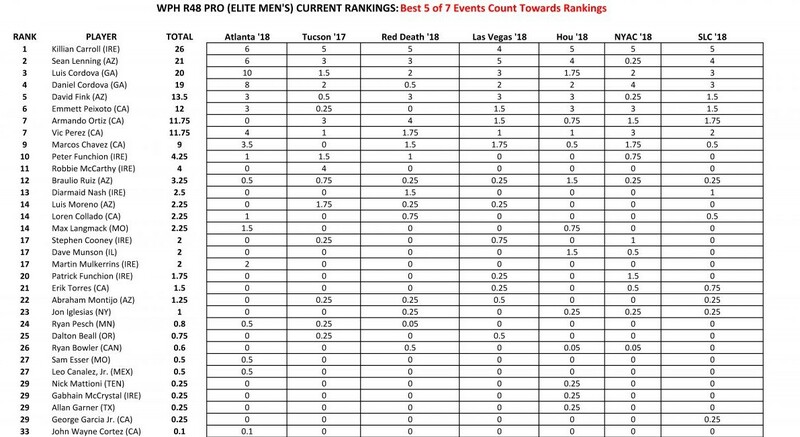 Check out all of the R48 rankings post Atlanta ’18 below.